Latinos Run looks to connect Hispanics with their local running communities one city at a time. 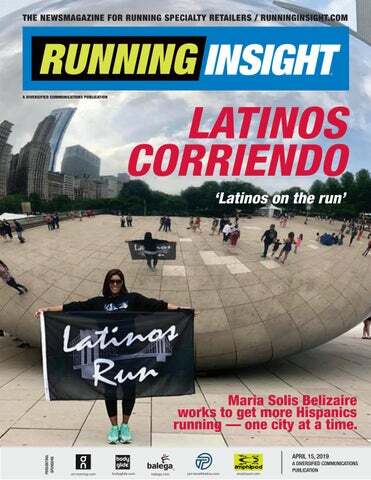 Maria Solis Belizaire has gone coast to coast with Latinos Run, starting in New York City in 2016 and making it all the way to San Francisco to spread the word. RUNNING INSIGHT ® is a registered trademark of Diversified Communications. © 2019 all rights reserved. Running Insight is published twice each month, is edited for owners and top executives at running specialty stores and available only via email.The opinions by authors and contributors to Running Insight are not necessarily those of the editors or publishers. Articles appearing in Running Insight may not be reproduced in whole or in part without the express permission of the publisher. Divesified Communications, 121 Free St, Portland, ME 04101; (207) 842-5500. Solis Belizaire and Latinos Run have run in 31 states across America, so far. and the start of a love affair with the sport. Soon after she would be introduced to an ultra-marathoner who encouraged her to join the local New York Road Runners club with a goal of completing a New York City Marathon, which she accomplished in 2015 (followed by three more NYC Marathons in 2016, 2017 and 2018 and the Chicago Marathon in 2018). Running became a life changing experience for her. After participating in countless races across the United States, including her five marathons with family and friends, Solis Belizaire began to think about the impact health had not only on herself, but others in her community. Having lost her mother and friends from cancer and other heath issues, including obesity and heart disease, she knew she had to do more. Hydration | Training |Race-Day |Visibility Contact your Amphipod Rep and book now! Latinos Run (continued) In 2016, unable to find a group that catered specifically to Latinos, she decided to take action and form Latinos Run in honor of her late mother, Miriam Calderon Solis. “What’s unique about our movement is that we are connecting with a community on a large scale,” Solis Belizaire says. “From our inception, our runners from Latin America have been able to connect with our runners from the States.” Running Across America Well-known names in sports and running have supported the Latinos Run effort, including (from top) former NFL star Tiki Barber, Nike athlete Eliud Kipchoge (center) and Skechers marathoner Meb Keflezighi (center). WEâ&#x20AC;&#x2122;LL GO TO ANY LENGTH TO MAKE THE BEST COMPRESSION SOCK. More than ever, the new CEP 3.0 No-Shows improve blood flow, boost energy and help alleviate pain, thanks to the remarkable 3.0 fit, which features an anatomically-sized arch and generous cushioning. Bioactive yarns deliver even more comfort. CEP No-Shows give athletes the perfect everyday way to embrace the pressure. 5 For Fashion (continued) unabashed perfectionism, rabbit apparel aims to be something better. Neither complicated nor fussy, rabbit touts a full line up of men’s and women’s apparel that includes shorts, tees, sports bras and pants. Available in about 75 run specialty doors across the U.S., rabbit apparel is manufactured in Los Angeles, roughly 100 miles south of rabbit’s Santa Barbara headquarters. This proximity allows rabbit leadership to monitor all aspects of production, to quickly bring compelling products to market and to ensure the fair treatment of workers. “We make running apparel that we want to wear and we do it in a way that we can feel good about,” rabbit PR manager Jeff Stern says. Focused on listening to the voices of its run specialty partners and customers, rabbit brings an assortment of colors, styles and designs to market each season a nd recently debuted a looser fit “freedom” line for women as well as its rabbitTRAIL line. pre-orders before closing the ordering window and heading into production, where runs typically range from 500-1000 units. The ever-revolving nature of INKnBURN’s designs allows its select running store partners – the Ultra Running Company in Charlotte and the three-door Running Center in California among them – to bring vibrant, exclusive gear into their stores on a near weekly basis. And, it’s worth noting, there’s a fanatical following for some INKnBURN gear. Its “holiday sweaters,” technical performance pieces that resemble a knitted sweater, have become collectibles in some corners, while one INKnBURN jacket even sold for $1400 on the secondary market. INKNBURN (ABOVE). RAW THREADS (BELOW). 5 For Fashion (continued) portfolio. Men’s and women’s apparel as well as accessories such as arm sleeves, headbands and patches are currently available on Raw Threads’ website as well as in run specialty stores such as Orlando’s Track Shack and Fit2Run locations across Florida. Territory Run Co. TERRITORY RUN CO. (ABOVE). RUN BK APPAREL (BELOW). OS1st® socks are designed with strategically placed medical grade support along with unique features to provide relief and to help prevent recurring symptoms from your everyday foot and leg pain. The newest member of the OS1st® Socks With Purpose® family is the BR4 Bunion Relief Socks. The BR4’s patent pending split-toe design and special targeted padding area helps relieve bunion pain and toe friction and separate the toes for a more comfortable fit inside of the shoe while still providing all the same support benefits you have become associated with other OS1st socks. A runner’s success in competitions depends on how well they’ve prepared so on race day they can focus on execution! This is the same for using Facebook ads. Facebook knows more about you (and your customers) than you know about yourself. It’s a better predictor of your habits and behaviors than you. Scary, but true! Most people who run Facebook ads think they control who can see their ads by selecting a “desire target audience,” but this cannot be further from the truth. The algorithm only takes about 10 percent of what you tell it to do and decides the rest on its own. Facebook has the steering wheel, not you. It has real-time access to everybody in the platform and it knows all of their data, including their entire user history, so the algorithm wants to make sure it matches the right message to the right person at the right time. The Facebook algorithm has the network, the knowledge of everyone on it and the natural selection engine capable of iterating more variable combinations in seconds than a thousand scientists could in five years. What it doesn’t have are the “initial conditions” needed for a successful campaign. A runner’s success in competitions depends on how well they’ve prepared so on race day they can focus on execution! This is the same for using Facebook ads — to run a successful ad campaign, preparation outside the platform is 95 percent of the battle and only five percent execution. New runners are always seeking advice from experienced runners; in fact, professional runners are likely to have a coach too. The same is true with business owners when trying to get into digital marketing no matter how long you’ve been in business. If you already have a digital marketer within your team, you’re likely dominating your market. If you don’t its best to request help when it comes to nurturing your business’ biggest asset, your customers. n Gerardo “Gerry” Perez, founder of RUNGP – www.rungp.net – is an entrepreneur and running aficionado passionate for everything related to the sport of running. He is a digital marketing consultant connecting run specialty stores, race directors and running coaches within the running community to help grow their businesses through proven client acquisition strategies. running shorts Balega Unveils Fresh Colorways and New Kids Socks For Spring. ASICS Enters Into Multi-year Deal with LA Marathon. SICS has entered into a five-year sponsorship deal with Conqur Endurance Group that will make it the official footwear and apparel partner and presenting sponsor of the Los Angeles Marathon beginning in 2020. This multi-year agreement comprises significant brand integration, on-site and in-store event activations, digital and social content, broadcast integrations and online retail promotions. ASICS and Conqur will re-launch their partnership in January 2020, beginning with the Pasadena Half Marathon, as the two build on their rich history together ahead of the Los Angeles Marathon in March. In addition to the 2020 Los Angeles Marathon, ASICS will expand its partnership in Southern California by becoming official partners of the Pasadena Half Marathon at the Rose Bowl, The LA Big 5K, and Santa Monica Classic 5K and 10K. ASICS will also look to support Conqur’s extensive youth running and community programs. “Our partnership with Conqur to become the presenting sponsor of the Los Angeles Marathon solidifies our commitment to the run category.” says Koichiro Kodama, CEO of ASICS North America. “ASICS is back and more dedicated than ever to drive our brand forward as we build off of the very foundation we were created on — performance running.” With a heritage deeply rooted in running, ASICS is making significant investments beginning this year to help it reclaim the top industry status, including run-focused activations and updates to its athlete roster, most recently signing multi-year sponsorship deals with female distance runners Emma Bates and Allie Kieffer. Bates is a 2018 USA Marathon champion and was the first American female to cross the finish line in the 2019 NYC Half Marathon, placing fourth. Kieffer is a distance runner who placed fifth in the 2017 NYC Marathon and seventh in the 2018 NYC Marathon. running shorts CEP Launches Commuter Sock With Fleet Feet. Alleviate symptoms of pain, minor soft tissue tears, strains, tracking issues, Tendinitis and Arthritis. Medical grade compression ranging from 20mmHg to 30mmHg depending on compression zone location. Flat Stitch Technology allows customized stitching to achieve 3D shaping of the fabric for an optimum ﬁt. Breathable, multi-directional stretch allows full range of motion while maintaining high level of support. You Spoke, The Running Event Listened A letter to the running industry from TRE Event Manager Christina Henderson. The WIDE WORLD of RUN Interested in Exhibiting? The Running Event is the intersection of all key players in the run industry.